Goodwood racecourse has signed a historic 10-year sponsorship deal with Qatar, the biggest single deal in British horse racing. The agreement will see more than £2m invested in eight key races, while annual prize money will increase. 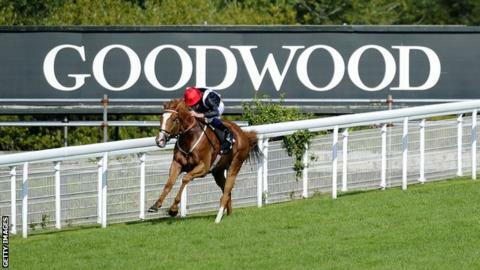 Glorious Goodwood, the main event, will become the Qatar Goodwood Festival. "Our partnership with Qatar will make an enormous contribution to horseracing in the UK," said course owner, Lord March. The inaugural Qatar Goodwood Festival will run from 28 July to 1 August. "The influence of Qatar on British sport grows ever greater, particularly in racing where members of the ruling Al Thani family are already major racehorse owners and financial backers. While this sort of sponsorship is obviously welcome, such is the level of Qatari support for racing now that sceptics are bound to start wondering about too many eggs in one basket. Punters may also need to be educated into talk of the 'Qatar Goodwood Festival' rather than one of sport's most famous brand names, 'Glorious Goodwood'." Hamad Al Attiyah, president of the Qatar Equestrian Federation, said: "The sponsorship demonstrates Qatar's further commitment to British racing. "With such huge prize-money on offer, we hope it will help to attract international runners from all over the world as well as continuing to see the best in Britain, France and Ireland." Races to benefit from the cash injection include the Qatar Sussex Stakes which will have a total prize fund of £1m and the Qatar Nassau Stakes which will now be worth £600,000.